Pristine jungle, dense and lush areas, serene environment and eloquently murmuring wild species rambling around the Jim Corbett Reserve; all set for the finest wildlife tour in India. The oldest national park in India, Corbett is best known for tiger reserve and large crowd thronging in this area to admire the royal presence of the national animal in the Himalayan foothills in Nainital, Uttarakhand positioned between 29-25′ to 29-39’N latitude and 78-44′ to 79-07’E longitude. With a core area of around 520 sq km and more than 100 species of trees, around 50 mammal species, nearly 600 bird species and more than 20 reptile species, Corbett Park truly offers tourists more than they can bargain for such a tremendous wildlife tourism in the virgin land of the Himalayas. 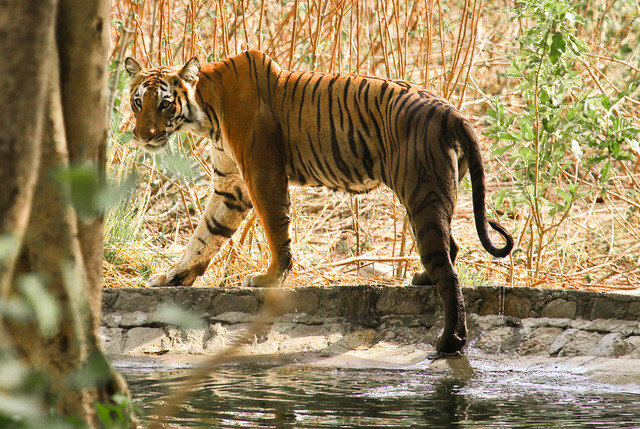 Being an animal lover you must be enthralled to step into the vast environment of the Corbett Reserve which has been best known for the tiger reserve project and can experience how fantabulously this larger part of the globe has been maintained for the conservation of wildlife. The land of the roar, trumpet and song, representing the scene of remarkable beauty has the proud distinction of being chosen as the venue for the inauguration of Project tiger in India. Also, the presence of both Himalayan and peninsular flora and fauna found in the reserve make this land more adorable for the “mission save the tiger project”. Surprisingly the geological survey of India has recorded over 585 species of resident and migratory birds here. 1. Eco-Development: The eco-development Committee members are being trained in participatory methods for micro-planning and monitoring at Corbett Centre for Conservation by conducting workshops and study tours. 2. Nature Guide Programs:A training course of two and a half-month duration was organized for 25 educated unemployed youth in 1993 to train the people in natural history, visitor management and park interpretation and later registered as nature guides in Corbett. 3. Eco Tourism: Different workshops have been organized to develop and understanding and agreement between different stakeholders to ensure biodiversity conservation and maximize benefits to the local communities. 4. Voluntary Support: The directors of the National Parks is being authorized to receive voluntary gifts from visitors and the NGOs which is being maintained by the director of the reserve. 5. NGO Support: NGOs are coming forward to assist the reserve in strengthening protection measures. 6. Education and Awareness: A visitor’s center has been constructed to organize activities for both children and the villagers and provide information to the visitors. Additionally, the reserve has its own in-house magazine to highlight the incidents and activities in Corbett. The Corbett Reserve majestically bears different kinds of forests including Northern Moist Deciduous, Northern Tropical Dry, Himalayan Subtropical Pine Forests. When we talk about the wildlife conservation, the department of forest reserve focuses on protection and the other thrust area is the management. Apart from that the management is also focusing on eco-tourism, the most splendid part of this reserve. To highlight this part, the reserve has been modishly divided into four amazing entry gates; of course for your convenience and you can easily get inside the reserve from all the corners of the jungle. These tourism zones are Bizrani Safari Zone, Dhikala Zone, Durga Devi Safari Zone and Jhirna Safari Zone. – Wildlife safaris like elephant, jeep and canter safari to appreciate the natural creatures in the jungle. – Birding, fishing and angling in Jim Corbett. – Adventure activities like rafting, bridge slithering and river crossing on Kosi River. – Most comfortable and luxurious stay at different Corbett hotels, resorts and lodges to convert the stay into a magnanimous vacation.